A S U P P L E M E N T T O T H E W I N N I P E G F R E E P R E S S | S A T U R D AY, M A R C H 3 0 , 2 0 1 9 | V I E W O N L I N E A T winnipegfreepress.com/publications Dayna Spiring, president and CEO of Economic Development Winnipeg, notes that Winnipeg and surrounding areas have become a hub for advanced manufacturing. "There are companies that are world leaders in what they do and they're all headquartered here, so it's pretty exciting," she said. "We do a lot of work with the manufacturing industry all the time through Economic Development because they are such a strong part of our economy." From food products and agricultural machinery to transportation equipment and packaging materials, Manitoba manufactures it all. "Our manufacturing sector is such a huge employer. It really moves the needle for the province of Manitoba," Spiring said. "There are about 64,000 direct manufacturing jobs in Manitoba. Keep in mind that there are many more jobs that support these 64,000 jobs, so the exponential value is much bigger." 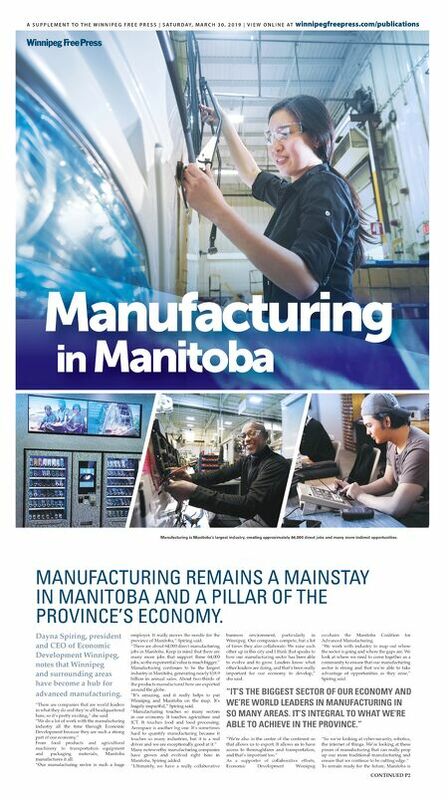 Manufacturing continues to be the largest industry in Manitoba, generating nearly $18.9 billion in annual sales. About two-thirds of the products manufactured here are exported around the globe. "It's amazing, and it really helps to put Winnipeg and Manitoba on the map. It's hugely impactful," Spiring said. "Manufacturing touches so many sectors in our economy. It touches agriculture and ICT. It touches food and food processing. Aerospace is another big one. It's sometimes hard to quantify manufacturing because it touches so many industries, but it is a real driver and we are exceptionally good at it." Many noteworthy manufacturing companies have grown and evolved right here in Manitoba, Spiring added. "Ultimately, we have a really collaborative business environment, particularly in Winnipeg. Our companies compete, but a lot of times they also collaborate. We raise each other up in this city and I think that speaks to how our manufacturing sector has been able to evolve and to grow. Leaders know what other leaders are doing, and that's been really important for our economy to develop," she said. "We're also in the centre of the continent so that allows us to export. It allows us to have access to thoroughfares and transportation, and that's important too." As a supporter of collaborative efforts, Economic Development Winnipeg co-chairs the Manitoba Coalition for Advanced Manufacturing. "We work with industry to map out where the sector is going and where the gaps are. We look at where we need to come together as a community to ensure that our manufacturing sector is strong and that we're able to take advantage of opportunities as they arise," Spiring said. "So we're looking at cyber-security, robotics, the internet of things. We're looking at these pieces of manufacturing that can really prop up our more traditional manufacturing and ensure that we continue to be cutting edge." To remain ready for the future, Manitoba is MANUFACTURING REMAINS A MAINSTAY IN MANITOBA AND A PILLAR OF THE PROVINCE'S ECONOMY. CONTINUED P2 Manufacturing is Manitoba's largest industry, creating approximately 64,000 direct jobs and many more indirect opportunities. "IT'S THE BIGGEST SECTOR OF OUR ECONOMY AND WE'RE WORLD LEADERS IN MANUFACTURING IN SO MANY AREAS. IT'S INTEGRAL TO WHAT WE'RE ABLE TO ACHIEVE IN THE PROVINCE."